This spring, the internationally lauded dance company BalletBoyz will present the London premiere of Them/Us, an innovative double bill and a brand new collaboration from the company’s own critically acclaimed dancers and the Olivier Award-winning choreographer Christopher Wheeldon. 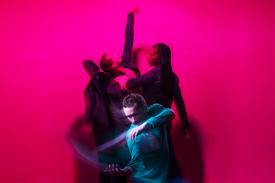 A co-production with Sadler’s Wells, Them/Us will arrive at the London venue from 5–9 March 2019, with opening night on 6 March. BalletBoyz are known worldwide for their ground-breaking live performances, films and TV appearances. The new productions are set to original scores by world-class composers, and ask where we see ourselves in relation to the “other”. Marking a first for BalletBoyz, Them is the work of the company’s very own in-house talent, and set to a score by emerging composer Charlotte Harding. Us is inspired by the critically acclaimed Christopher Wheeldon duet featured in the company’s last show, Fourteen Days. With an extended score by cult singer/songwriter Keaton Henson, Christopher Wheeldon develops this new work which explores the possibilities of before, during and after. Christopher Wheeldon is a British choreographer who trained at The Royal Ballet School and danced with The Royal Ballet between 1991 and 1993. With the New York City Ballet he performed as a soloist and became the company’s first-ever artist in residence and first resident choreographer. Christopher has created productions for all the world’s major ballet companies, and in 2007 he founded Morphoses/The Wheeldon Company and became the first British choreographer to create a new work for the Bolshoi Ballet. His awards include the Tony Award for Best Choreography for An American in Paris, and he was made an OBE in 2016.